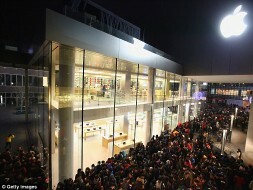 The much-anticipated release of the iPhone 4S in China stumbled out of the gate in Beijing, after unruly crowds kept the store closed on release day. Apple’s main store in the Sanlitun district of Beijing, the first of its kind to open in the country, was pelted with eggs and minor scuffles broke out after an unidentified store representative announced that the store would not be opening. Apart from the Apple Store in Hong Kong’s IFC Mall, which started selling the iPhone 4S back in November, you would assume that the largest mobile-phone market in the world would have slightly more Apple retail points than the meager two in Beijing and three in Shanghai. To avoid such incidents in the future, Apple has decided to restrict the availability of the iPhone 4S to online sales and the stores of its local carrier, China Unicom. Everyone type..type.type so much! i wonder who is reading!? Trolling... i have my first Android phone and i don feel its slow... btw slow to do what calling, sms or browsing news. BTW the app call PULSE for news browsing is simply amazing comparable to my ipad flip board. Well said. It took me couple Android phones to know Android is laggy and very buggy. The user experience isn't good enough for me.